Thanks to some high quality co-thinking with some of my coachees and colleagues, I’ve had couple of insights around David Rock’s “Choose Your Focus” model lately. Main point of the model is that three levels above the line (Vision – Planning – Detail) are the productive, solution-oriented ones. In coaching, we go through those three levels when we want to achieve something. We need to have a positive vision, based on which we can do planning on how to get there, based on which we can go to details on how to start and what to actually do in practice. Two levels on bottom (Problem – Drama) are the problem oriented levels, which are very natural to humans, but are not so productive to keep your focus on if you want to change things. I don’t go describing the whole model here in detail, but you can look it up if it’s not familiar or read more about it in an excellent book “Quiet Leadership” by Rock. It’s a very useful model, and works on many different levels: individual, team or organization. It could also be Vision – Process – Detail. It’s not always necessary to have even a rough plan or steps or milestones to get where you want. It’s enough if you just keep doing something, and then adjust based on your progress and learning as you go. I’ve read about motivation and mastery quite a bit, and more important to becoming really good in something is that you like to do it, not that you would like to be good at it. I.e., liking the process is more important than liking the vision. If you want to be master at tennis for example, you are better off if you really like to just play tennis what ever your current level is. You will constantly get better at it. You don’t need to chart actual steps towards mastery in advance, at some point you will just realize that you’re pretty good at it if you just keep playing. In fact, if you could have just one of those – Vision or Process – choose process. Vision will reveal itself eventually, but only having the vision and not doing anything will take you nowhere. So, along with Rock’s Vision – Planning – Detail model, I have started to use Vision – Process – Detail model. Many people are good on some, not all of these areas. 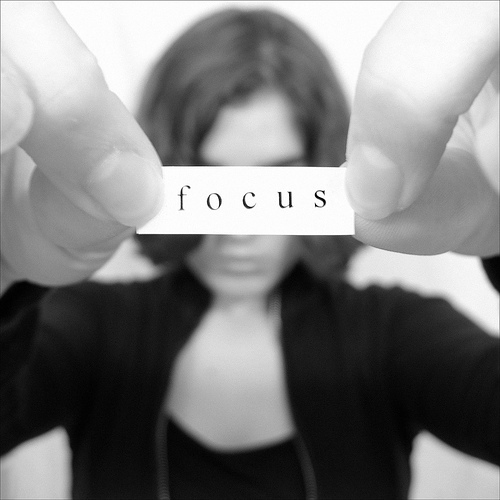 In my coaching, I have noticed that different people struggle with different areas of “Choose Your Focus” model. I have met people who are great in making plans and coming up with details, but lack the drive to do anything because they can’t come up with an inspiring vision. I have met people who are good at visioning and coming up with rough plan on how to get there, but can’t get themselves started with any detailed actions. And finally, I’ve talked with people who are great in visioning and easily see lot of detailed tasks that are clearly connected to the vision, but mentally resist putting together a plan or process so they would know from where to start and how to proceed. This is really fascinating, because by default I’ve been using the model so that together with the coachee we roll through all those steps to get them going with what they really honestly want to achieve. But it has become apparent that different people struggle with different parts of that model. So now the question becomes, should we focus on working on the weakest area? Or should we try to take advantage of the strong areas and work around the weakness instead? If you are an athlete that is very good in high jumping, you don’t go training for hammer throw. You keep doing even more high jumping. In similar fashion, you could just go for roles where you can shine using your strengths while acknowledging your weaknesses. While maybe looking for other people to support on the areas that are not in your focus. Or from personal development point-of-view, try to utilize your strengths to cover also for the weaknesses, e.g. putting together a powerful process to overcome the lack of visioning. These insights are something I’m just starting to explicitly work on, so I don’t know yet what leads to best results, or where this might lead in general. But the insights themselves have already been very valuable for my coaching.